Less than 1 per cent. EA has outlined the odds of getting rare FIFA 19 Ultimate Team (FUT) cards in its first in-game promotion, Ones to Watch. As reported by Eurogamer, the 23 live cards—including special editions of Cristiano Ronaldo and Riyad Mahrez, who each moved clubs before the season began—are tweaked throughout the year to reflect excellent real-life performance, making them just that little bit more desirable than their standard versions. Through a new Show Pack Possibilities feature—a welcomed addition implemented following a ruling from Belgium's Gambling Commission—it's now clear to players that there's less than a one per cent chance of securing a Ones to Watch card. 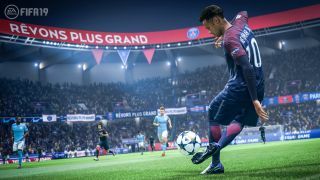 EA Sports vice president Daryl Holt explained how the system would work over the summer, stating that FIFA's Ultimate Team packs are different than other games in its portfolio, like Star Wars Battlefront 2. "For Ultimate Team, when you buy a pack you know what you are getting. You are getting a certain number of assets that are guaranteed—and we're going to start to do pack odds disclosures that'll show you the odds of what you might get," Holt said. "That'll be in our product year 19 titles. So, at least that aspect of understanding what the chances are of getting X, Y, and Z card." As the screenshot above suggests in the small print at the bottom, these odds may fluctuate—although how, and why, has not been confirmed—and the pack contents are "dynamically generated and verified".